Date for next Children’s Network Meeting: Monday 6th February 2017 at Hope Baptist Church, 12 – 2pm, bring a packed lunch. 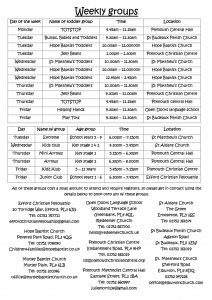 Please see below a list of Children’s events and weekly groups in Plymouth. 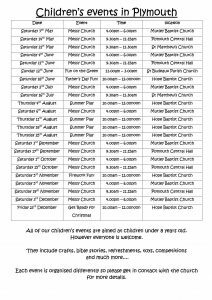 If you have any additional information about events or groups for children in the city please contact Liz at Plymouth Christian Centre so they can be added to this listing (liz@plymouthchristiancentre.org).